A militia is a group of people not in the military who do many things that the military does. This includes collecting weapons, training soldiers, defending people or land, policing an area. Militias are often made up of veterans who were once in the military. Some militias are organized by a government, like the United States National Guard. This is a group of state militias who help with wars, natural disasters and other emergencies. Others are not connected to a government, and may even be illegal. 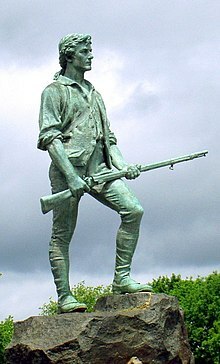 One common definition of a militia includes all men who are able to serve as soldiers. At the beginning in the late 20th century, some militias acted as professional forces, while still being "part-time" or "on-call" organizations.